Aviyal is a simple and delicious dish prepared with mixed vegetables and curd/yogurt. यहोवा का दहिना हाथ महान हुआ है, यहोवा के दाहिने हाथ से पराक्रम का काम होता है! Scrape the upper layer of skin from the snake gourd and slice in half lengthways. Scoop out the soft white middle and discard. Cut into 4cm lengths. Slice the drumsticks, yam, carrots, banana and cucumber into 4cm-long pieces. Put the coconut, chopped chillies and cumin seeds in a bowl, add a splash of water and Coarsely ground together until have a coarse paste. 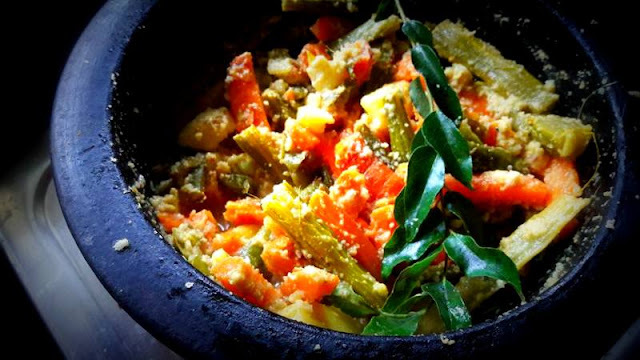 Put the sliced snake gourd, drumsticks, yam and carrots in a saucepan set over a medium heat. Add 200ml water and the turmeric and cook for 8-10 minutes, stirring occasionally. Stir in the banana, yellow cucumber, mango flesh and the coconut paste. Cook for 4-6 minutes more, or until the vegetables are tender. Drizzle over the coconut oil, add the curry leaves and mix together.